It is notable that in post World War 2 America, the poverty rate was declining constantly every year, until in 1973 it hit a level of just below 8.8% from where it has since then bounced back to now around 11% and rising. Well, one way to approach this is the following: What do you expect would happen if the government started to enact new major welfare programs that would affect families across the board? Of course: the programs would keep the recipients in poverty, rather than motivating them to lift themselves out, and, as a tendency, produce a lasting underclass of dependents. (…)The Civil Rights Act of 1964 forbade job discrimination and the segregation of public accommodations. The Voting Rights Act of 1965 assured minority registration and voting. It suspended use of literacy or other voter-qualification tests that had sometimes served to keep African-Americans off voting lists and provided for federal court lawsuits to stop discriminatory poll taxes. It also reinforced the Civil Rights Act of 1964 by authorizing the appointment of federal voting examiners in areas that did not meet voter-participation requirements. The Immigration and Nationality Services Act of 1965 abolished the national-origin quotas in immigration law. The Civil Rights Act of 1968 banned housing discrimination and extended constitutional protections to Native Americans on reservations. The centerpiece of the War on Poverty was the Economic Opportunity Act of 1964, which created an Office of Economic Opportunity (OEO) to oversee a variety of community-based antipoverty programs. The OEO reflected a fragile consensus among policymakers that the best way to deal with poverty was not simply to raise the incomes of the poor but to help them better themselves through education, job training, and community development. Central to its mission was the idea of “community action”, the participation of the poor in framing and administering the programs designed to help them. The Higher Education Act of 1965 increased federal money given to universities, created scholarships and low-interest loans for students, and established a national Teacher Corps to provide teachers to poverty-stricken areas of the United States. The Act also began a transition from federally funded institutional assistance to individual student aid. The Social Security Act of 1965 authorized Medicare and provided federal funding for many of the medical costs of older Americans. The legislation overcame the bitter resistance, particularly from the American Medical Association, to the idea of publicly funded health care or “socialized medicine” by making its benefits available to everyone over sixty-five, regardless of need, and by linking payments to the existing private insurance system. In 1966 welfare recipients of all ages received medical care through the Medicaid program. Medicaid was created on July 30, 1965 under Title XIX of the Social Security Act. Each state administers its own Medicaid program while the federal Centers for Medicare and Medicaid Services (CMS) monitors the state-run programs and establishes requirements for service delivery, quality, funding, and eligibility standards. I think it is at the very least fair to say that evidence exists to corroborate our (actually rather unsurprising) theory that government welfare programs are not introduced by bureaucrats in order to end poverty, but rather to make sure it remains at a level that allows them to justify the existence of government programs intended to battle poverty with money that of course in the end mostly ends up in the hands of the bureaucrats themselves, not the poor, as I outlined before. I’m sure the supply shocks and poor monetary policy of the 70s had nothing to do with an increase in the poverty rate. Also, your description makes it sound as if the poverty rate quit declining in 1973 and began rising to where we are today. It has actually bounced around quite a bit since then. I’d note that rises in the poverty rate appear to correspond pretty tightly with recessions. That wouldn’t seem to support the idea that welfare programs reduce the incentive of the poor to work. It would suggest that they work and lose their jobs during recessions. Also, do you think it is realistic to think the the post-WWII boom would continue unabated forever? If not, can you really believe that the decline in the poverty rate was going to continue to recede forever? Yes, that is basically what I am saying: If it wasn’t for government intervention, growth would continue unabated forever and people would not be herded into a permanent underclass of dependent welfare recipients. I’m submitting this data as one more piece of evidence to corroborate this thesis. If you think that the sum total of my arguments is confined to this one article I wrote, then I think there might be a slight misunderstanding on your part as to what it is that I’m doing here, if that makes sense? Charles – good points, but a lot of the poor monetary policy of the 1970s came from Government attempts at price controls. Would you and Nima consider what may have happened if in 1964, the government had established a minimum income and simply transferred money to poor people? I think the combination between that and eliminating income tax and instituting a VAT where the minimum income level acts as a “prebate” for poor people could have been far more effective. 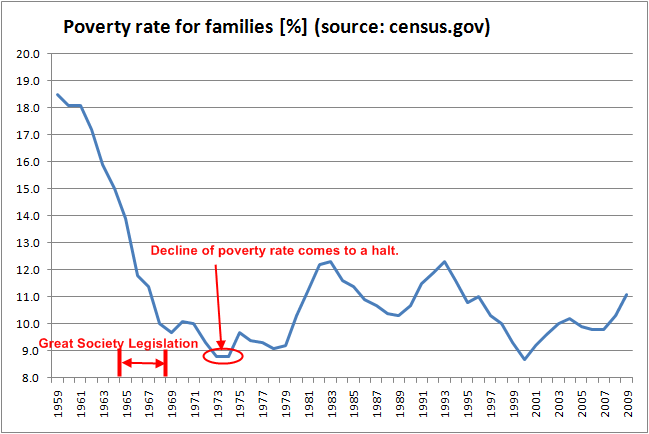 Poverty spikes upward for the first time under Nixon, after removing the US from the Gold Standard. Returns to it’s lowest since then under Clinton. One could look at this data and conclude that Republican monetary policy benefiting the rich has sapped money from the economy that would have been circulated, engaging in the multiplier effect and creating jobs, and concentrated that money at the top in investments that don’t create jobs. Just because it all happens after the great society programs doesn’t in any way indicate they are the cause. Real worker pay continued upward until 1980 since then it has not increased much at all. That seems like it would logically cause more poverty no? I’m submitting this data as one more piece of evidence to corroborate the thesis that welfare programs facilitate unemployment. Unfortunately none of those questioning this thesis in this thread have actually submitted any specific data to back up their opposition. Willy-nilly political conclusions like “Republican monetary policy benefiting the rich has sapped money from the economy that would have been circulated” belong in the realm of bigoted, boring, and small minded politicking a la Fox News, CNN, or NBC, but not in that of scientific, precise, and rigorous inquiry and research, so I won’t dignify it with a response. But in any case: If you think that the sum total of my arguments is confined to this one single article I wrote, then I think there might be a slight misunderstanding on your part as to what it is that I’m doing here, if that makes sense? The actual graph from the census website is here. As you can see, the years of the Great society showed a much larger decrease in poverty than at any other stretch of time since 1959. The fact is still true even using your graph which you clearly lifted from somewhere other than the census website in an attempt to give yourself some credibility. Nowhere on either graph do you see such precipitous drops in poverty over a 7 year period. The Great society has allowed seniors to get medical insurance which they could not obtain before and still can’t obtain anywhere else since no private insurer wants to insure such an at risk demographic. Before Medicare the percentage of seniors living under the poverty line was much greater than the general population. Now it is far lower. High school graduation has grown from 41 to 81 percent of all Americans and college graduation has grown from 8 percent to 24 percent by 1999 thanks to federal grant programs created by the Great Society.http://www.washingtonmonthly.com/features/1999/9910.califano.html I guess all those people getting a better education are somehow victims of government programs designed to disenfranchise them and kill their motivation? It seems obvious after reading this nonsense why conservative ideology is for the most part limited to the blogs of the net (which anyone can have) and liberal ideology is prevalent with the halls of academia. Thanks for the input though, debunking conservative nonsense still serves as a decent exercise in debate and political history. You could have simply asked before launching into an embarrassingly uninformed, biased, hasty, and immature tirade. here’s how we explain it: Ronald Reagan and the rollback of the new deal & the great society, the creation of homelessness via reagan housing policies, and neoliberal tax policy. The expansion of the welfare & warfare state during the time where a guy named Ronald Reagan was serving as the distraction puppet called President and beyond that certainly didn’t help improve matters much. The welfare state was not expanded under Reagan, it was undermined in multiple ways. The warfare state *was* expanded, and the concentration of income toward the top, always present, was heightened, again via multiple mechanisms. Then there was the Reagan-Volker recession, a deliberately induced recession intended to squeeze labor. Those were just the opening salvos (save for a few under Carter) in a highly successful 30+ year war that has produced low growth, low wages, social distress and dysfunction, growing economic insecurity, but has been great for big capital. Culminating in what we are seeing today, the worst economic disaster since the Great Depression & a full-scale attack on the last vestiges of the New Deal & the Great Society by the forces of the far right & the fake left, both of which are fully on-board with neoliberal economics. Your ‘evidence’ about Great Society programs causing poverty doesn’t stand up to scrutiny. yes, the young generation is so clever, that’s why they’re the most heavily indebted young generation in history. the welfare state didn’t take out those school loans & the welfare state didn’t kill off jobs. that would be the neoliberal/neocon warfare state. there are useful idiots, but they are not the supporters of the welfare state. they are those who bought into the reaganite party line in the 80s & who are now buying into the ‘sustainability = killing off the welfare state’ rhetoric today. young people will find out what that means. it means, in fact, *them*. The assertions made here have little to no connection with the data you’ve provided. Anyone looking at that graph can clearly see that the decline in poverty accelerated with the enactment of Great Society legislation. There is a 3.5% decrease from 1959 to 1964, but from 1964 to 1969 there is a 5.2% decrease. The next five year period has a smaller decrease, but if your theory that government assistance actually keeps most people in poverty rather than helping them out, the graph would show poverty rising from 1964 to 1973, not falling at an unprecedented rate. Your theory also ignores that fact that despite the fluctuations in poverty since 1973, poverty has never once gone back to pre-1965 levels. This completely contradicts your claim that welfare programs have contributed to the problem of poverty rather than alleviating it. If this were true, we should see higher poverty today than before the Great Society. Instead, it’s much lower. I’m really at a loss as to how you can look at that graph and arrive at the conclusions you’re making. It seems like you came to this theory through some other means, then looked at the graph, then tried to warp your understanding of it in order to fit your preconceived theory. Newsflash: Government programs don’t take immediate effect. The rot is a long term one. This would make an interesting designed experiment, but the assertion that correlation does not equal causality is correct. Previous Previous post: Financial Reform Bill a Great Success … for the Banks!